Is there such a food that makes one forget about all their problems? Is there a food that takes one out of reality and into a dream world of flavor and deliciousness? Is there a food that hypnotizes the mind and soul? The answer: Yes. A most emphatic Yes. 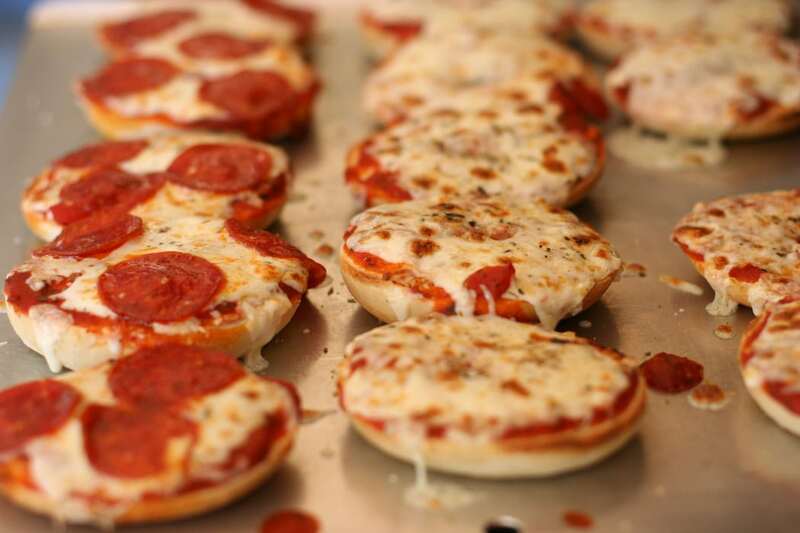 It is called the Pizza Bagel and it is a wondrous combination of flavor and awesomeness. The Pizza Bagel can be bought at Bagel Boy in Sioux Falls, SD. Upon entering Bagel Boy, I walk with a spring in my step over to the counter and peer into the bagel rack to make sure they have the "Everything Bagel" which is by far the best type of bagel to use for the Pizza Bagel. One time, I walked into Bagel Boy and the worker informed me that the Everything Bagel was out for the day, I couldn't believe it. I put my head down and did the zombie shuffle out the door and into my truck, where I sat for 10 minutes and cried. I drove straight home and sat in a dark room, depressed for three days. When ordering the Pizza Bagel, make sure the worker puts a pepperoni over the hole in the bagel because then the sauce will not leak out the hole and fall onto your pants, making a slightly embarrassing stain on your trousers. I like to go to Bagel Boy, order a Pizza Bagel and then sit by myself in the corner of the restaurant and enjoy the delicious, flavor packed wonder that is the Pizza Bagel. It is best to sit alone, away from the other people because they often give odd glances of confusion as I sit there, eating with a giant smile plastered across my face the whole time. Upon first bite, the combination of cheese, sauce, pepperoni and the multiple flavor crystals of the Everything bagel such as onion, poppy, garlic, etc. makes my taste buds overflow like the Nile river. Each time I am fortunate enough to make it to Bagel Boy, I order a cinnamon crunch bagel with cinnamon and sugar along with my Pizza Bagel because when the Pizza Bagel comes out of the toaster, it is too hot to eat, so the cinnamon and sugar bagel serves as a nice little appetizer while you wait for the Pizza Bagel to cool. Eating the Pizza Bagel when it is too hot is one of the worst things a human can do because one can not enjoy all the flavor if it's too hot. So be patient. Dig down deep to find the strength to wait for it to cool off. Once it has reached the appropriate temperature, though, tear in to that thing with reckless abandon. So, next time you are in Sioux Falls or any city with a Bagel Boy, stop in. Order up a Pizza Bagel on the Everything Bagel. You will be glad you did.